Noah’s allusion to the time he was briefly the subject of controversy—when, after being hired for his Daily Show gig, some unsavory jokes he’d made were dug up—was, on the one hand, surprisingly frank. For the most part, Noah stayed in character during the ceremony, acting as someone ironically respectful of the president. But it also spoke to the underlying joke of the library: Social media is both permanent and ephemeral. It may be hard to remember Trump’s Twitter nonsense from years ago—his war with Diet Coke, for instance, had slipped my mind—but as it is for everyone, even his deleted tweets are never truly gone. Located in midtown Manhattan, just a short walk away from Trump Tower, The Donald J. Trump Presidential Twitter Library opens today for its short, weekend-only run. Credit is due to The Daily Show team behind it, who took what could have been just printed-out tweets stuck to the wall and rendered them into something cleverly conceptual, adding gallery note cards to “explain” some of the artistic motivation behind his under 140-character statements. The accompanying description of “Covfefe,” for instance, notes: “With confident reference to Gilbert Stuart’s ‘Unfinished Portrait’ of President Washington, President Trump compels viewers to a greater level of engagement, demanding that they fill the post-fragment negative space.” Other sections are dedicated to Trump’s “Constructive Criticism” and his “Deleted But Not Forgotten” works. There is an entire island paying tribute to his “Concern For The Integrity Of The American Presidency”—a.k.a. his “birther” pursuit of President Obama. Noah has described the library as “living,” while Klepper noted that the planners had to stay “nimble.” So if Trump tweets during the 11 a.m. to 7 p.m. visiting hours—which, frankly, seems unlikely, given his early morning habits—an alarm will sound. 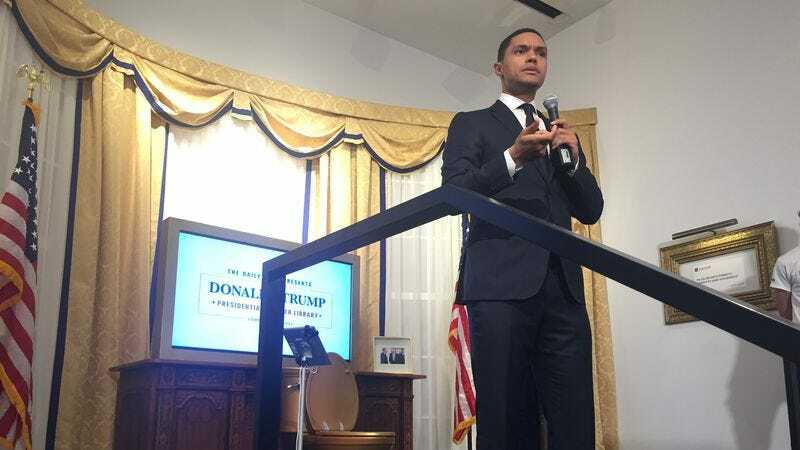 “Whenever a new tweet happens, the room will be alerted by a magical sound inspired by the infamous line the president once said,” Noah said. “I think it was bing bing bong bong bing bing bong bong. And once that sound emanates throughout the room, people will know that the president has spoken from those beautiful tiny little thumbs.” Speaking of “tiny thumbs,” when entering guests are greeted by a sculpture of those little fingers clutching an Android. A staircase just to the side of that leads to a replica of a locked vault where Trump’s “tax returns” are held. Noah maintained something of an arch tone throughout his conference, but Klepper and fellow correspondent Hasan Minhaj were more upfront about the fact that, although it’s superficially funny, seeing all these tweets together paints a rather scary picture. The Donald J. Trump Presidential Twitter Library is located at 3 W. 57th St., New York City, New York, and is open from June 16-18, 11 a.m.-7 p.m. Admission is free.